Teenagers in 2019 want the best of everything: the best trainers, best phone, best laptop and best footwear. So why not get them the best bed! Teenagers have a lot to handle in this modern world, not the least of which is their changing bodies. This is a very important time for young people with raging hormones, having to keep up with their friends and using the correct social media sites. It is extremely important that they have the correct mattress to accommodate their changing bodies. 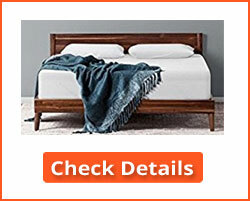 Not just the correct type of mattress, but the also the correct size of the mattress. A twin might seem OK when they are younger, but growing teenagers need something more substantial: a twin XL or even a full XL provides adequate support while accommodating a growing body: from early teens to full adulthood. We shall first present our 5 best rated mattresses for teenagers in 2019, then a Buyer’s Guide to help you make your choice. We shall be using the Twin XL size as our standard, or the Full where that is nor available. 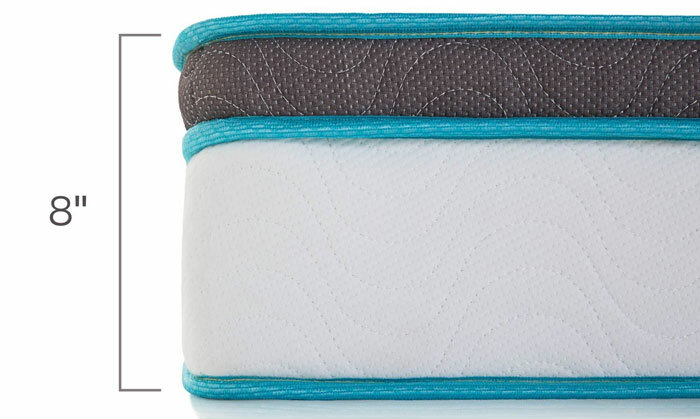 CertiPUR-US: You will find this certification on most of the mattresses we review. This means that the foam used in the construction of the mattress is free from VOCs, heavy metals, toxic fire retardants and ozone depleters. In other words, it is safe for your family to sleep on. 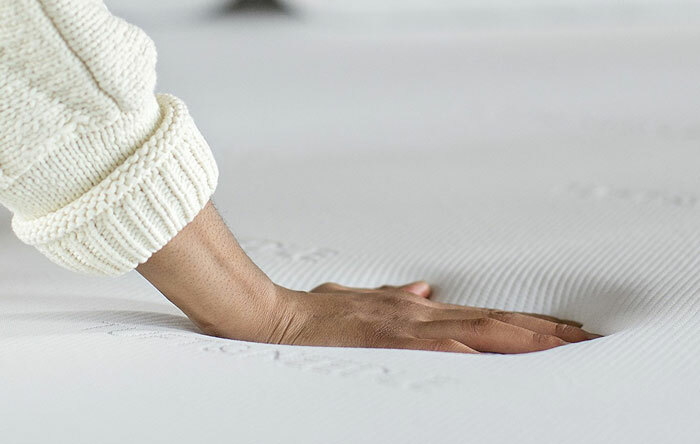 The Tuft & Needle Twin XL mattress is manufactured using an ‘adaptive foam’. 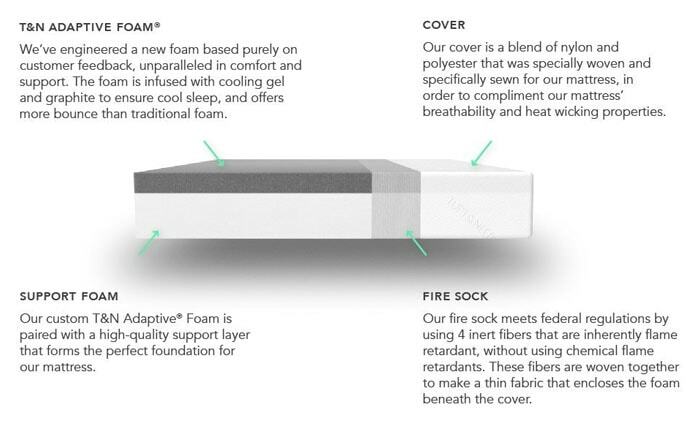 This type of foam is claimed to be more advanced than standard memory foam in that it does not make you hot when sleeping, nor does it give you that ‘trapped’ feeling that you can get with some memory foams. It helps maintain a good posture when the teenager is sleeping – and also growing! This type of foam provides excellent support for pressure points, which is important for teenagers as they grow, This is a ‘medium’ hardness mattress, ideal for holding the growing weight of teenagers as they develop into adults. It offers the localized bounce young people often need as they lie on their bed with their Xbox, or using their laptop to check out Snapchat or Facebook. Equal to or better than memory foam. Good support with bounce – without the ‘enclosed’ feeling of some memory foams. Firm and supportive enough to maintain a good posture – important while growing teenagers sleep. Helps keep you cool at night. 100 Night sleep trial with a full refund guarantee if purchased through Amazon. Some users find the mattress too firm for their liking. However, a soft mattress is not ideal for a growing teenager. Editor’s Notes: Tuft & Needle is a fairly new American company who makes its own mattresses. This is an ideal mattress for teenagers because it helps keep them cool at night, while offering good support and bounce. A good sleeping posture is essential as young people grow. We are reviewing the Twin XL because it is longer than the twin. Some might even prefer the Queen size which is wider, though the Twin XL is wide enough for teenagers. We considered the Full XL, although not all manufacturers offer that size. 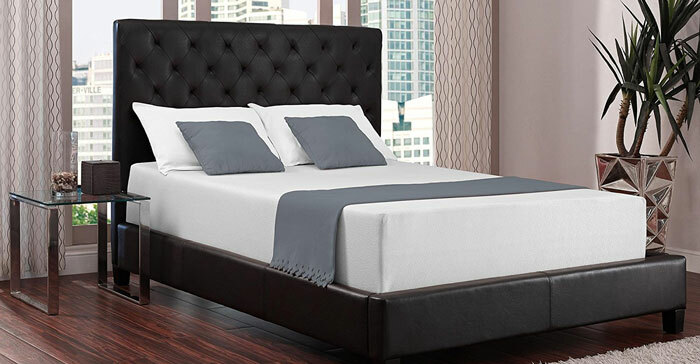 This 8-inch thick mattress comprises 3 inches of regular memory foam, 2 inches of pressure relief comfort foam and 5 inches of a high density support foam. 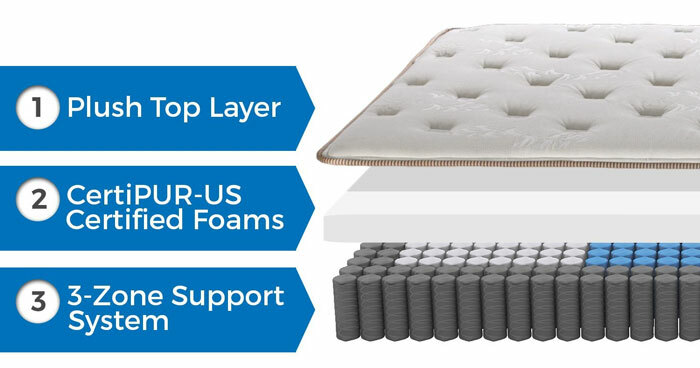 The various layers may appear thin, but when combines into an 8-inch thick mattress, it offers superb comfort and excellent support for a growing teenage body. It also has a poly jacquard fabric cover. The pressure release comfort foam does what it says it does: it not only helps relieve pressure on your pressure point, but it also helps keep your teenager cool when sleeping. By ‘cool’ we mean cool in the temperature sense, not in the ‘with it’ sense. However, this mattress is ‘with it’ in terms of teenage sensibilities. It certainly provides anybody, not just a teenager, with a deep and refreshing sleep. Another memory foam/support base mattress that supports a growing teenager in the way it should. Eliminates pressure points when sleeping, so helps to prevent back and joint pains. CertiPUR-US certified indicating the same lack of chemicals as explained earlier. Some issues regarding the level of firmness. This may be a matter of perception. Editor’s Notes: We have reviewed the 10-inch Full mattress – again this is not available in the ideal Twin XL size. It is also available in Twin if your teen’s bedroom is too small for a Full size mattress. Much depends on the size of the bed frame or platform. It is also available in Queen and King. The 10-inch Full size is also available where you get an extra two inches of memory foam. The Twin 10-inch mattress differs from the Full above only in dimensions. 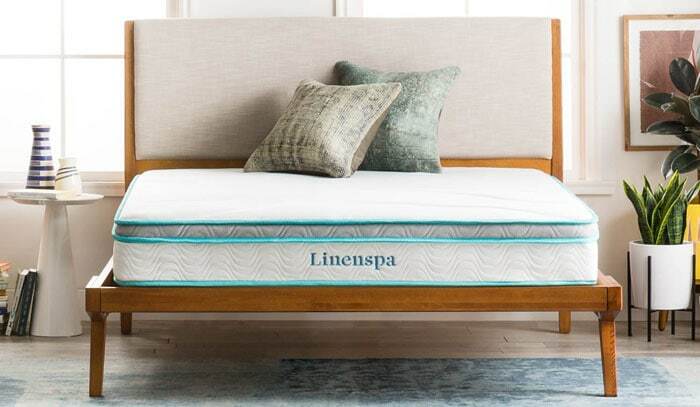 Although just 8-inches thick, this LinenSpa mattress punches way above its weight. A lot has got to do with its construction. The top of the mattress is a cozy feeling quilted memory foam with a 1.5 inch layer of foam beneath it. This helps to ease pressure on the shoulders, back, hips and other pressure points. Beneath that is a felt pad insulating the mattress from the steel coils that offer the main support and traditional bounce. You can see what’s inside the mattress. Check how does it look from side and close view. This ideal Twin Xl size is perfect for teenagers. Good comfort layers with a supporting innerspring core of 6-inch steel coils. Few negatives: some buyers think it too soft and others too hard. The vast majority liked it. Editor’s Notes: This combination of modern and traditional mattress technology combines the best of the two eras to come up with a mattress for teenagers that offers comfort, support and bounce. Your kids don’t fall onto this mattress and get stuck there – they bounce and can use the mattress as a platform for gaming or networking. This mattress is available in Twin, Full, Queen and King size only, but is so appropriate for a teenager that we have included it here with the 12” Full size as an example. 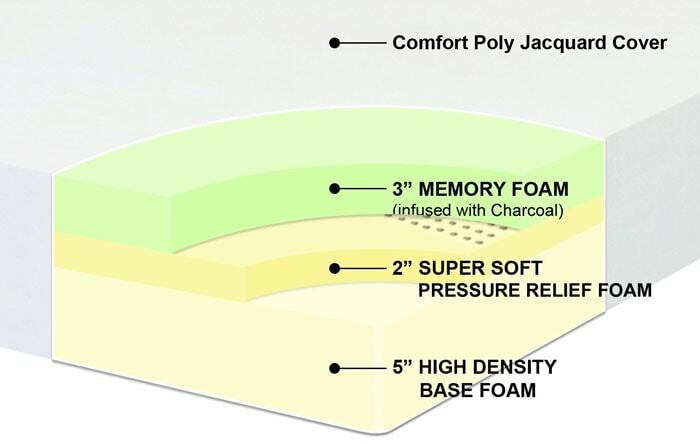 This is a 12-inch memory foam mattress comprising a 3.5 inch top memory foam later over 8.5 inches of dense support foam. 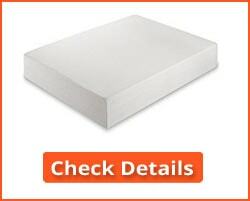 The 3.5” thickness of the memory foam layer is sufficient to provide the full memory foam experience. Most people like this, but there are those that don’t. The high-density foam support base prevents your teenager from disappearing into the 12 inches of foam. He or she is provided with a comfortable top sleeping layer, and the support they need to keep their body shape stable throughout the night. This is important for growing teenagers. 12 inches of foam offering good support and excellent memory foam support for the pressure points. This helps to prevent hip, back and neck pain due to a poor sleeping posture no matter how much the teenager tosses and turns. 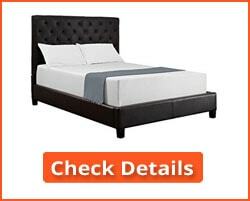 Comes with a breathable knit fabric zippered mattress cover that is easily removed for machine cleaning. Some complaint about the time taken for the mattress to inflate to its correct size after opening the package. The company recommends 72 hours. Foam mattresses are often vacuum packed to reduce the package size. It takes time for the air to make its way back into the mattress, although some people try to use it too soon. The only other complaints appear to refer to the memory foam. Some people just don’t like memory foam. Editor’s Notes: This is an excellent mattress for teenagers in 2019. 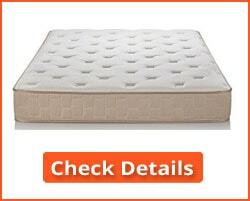 It combines the best of two options: a good thickness of memory foam and a high density latex. The combination of the top memory foam layer and the lower high density layer offers good support for the pressure points and the whole body. The memory foam molds round the body, while the support layer supports the whole weight. The shoulders, hips and knees are not supporting the body by themselves – that would cause sagging of the lower back and corresponding back pain. 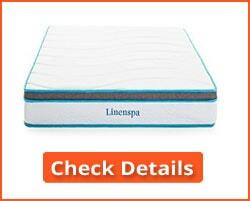 The main support layer of this mattress is a traditional innerspring construction. Above that lies 1.5-inch layer of foam beneath a layer of memory foam quilted into a comfortable top layer fabric mattress cover. 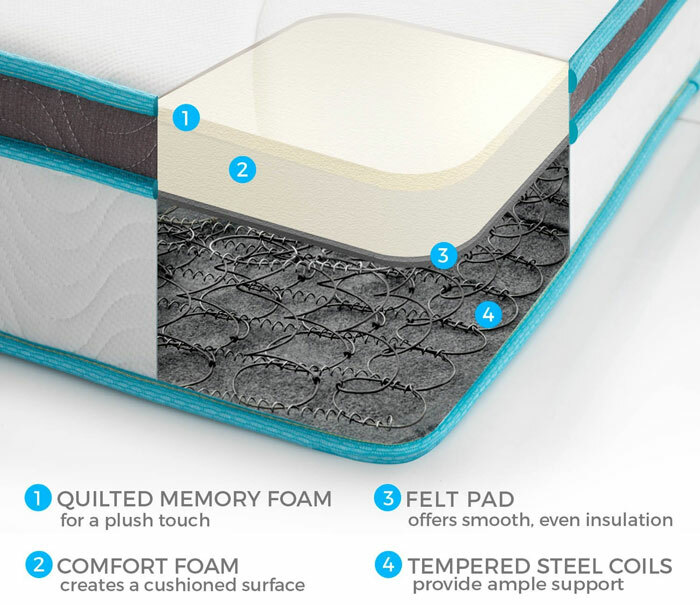 The foam helps to reduce pressure on your pressure points for a more comfortable sleep. The innerspring layer of steel coils provides a strong inner core. While the soft layers above it offer comfort, the innerspring core provides the stable sleeping base that young teenagers need. Particularly those that use their bed for more than just sleeping on. A good core of steel springs that offer good old-fashioned strength to the mattress. A restrictive and limited 1-year warranty only. Never remove the ‘law tag’ or your warranty will be invalidated. Otherwise, there are few negatives to this mattress. Editor’s Notes: Although this is a good mattress for teenagers, it is fifth in out lists or two reasons: 1) The comfort layers are thin in comparison with those reviewed above it, and 2) The warranty leaves much to be desired. It is inferred that even the slightest stain on the cover will render the warranty invalid. 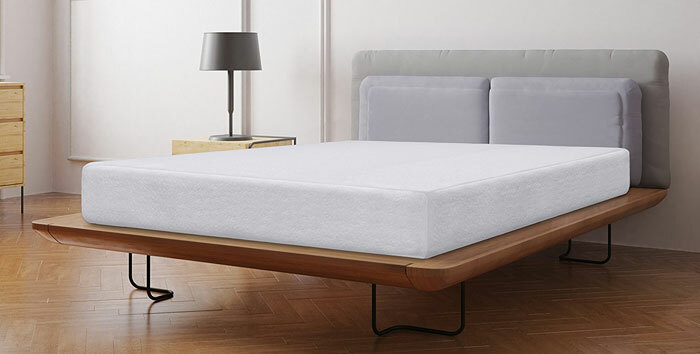 However, it deserves its position on this review of the best rated mattress for teenagers in 2019 because it suits teenagers’ needs very well. Why specifically teenagers? What’s so special about that age group that they need specific types of mattresses to sleep on? We were all a teen at one stage in our lives (usually our teenage years!) so it shouldn’t confuse you that they expect specific attention! Most of them think they have it tough, and while they had it a lot less tough than their parents at that time of their lives, there are certain aspects of teenage life that need special attention. It is during the early teens that most growth spurts take place. It should be no surprise, then, that it is around this time that teenagers are pushing their parents for a new bed – or at least a new mattress. In addition to the spurt in growth, and hence in height, many teenagers also suffer growing pains. These are physical pains that can be very distressing to some teens. He or she may need a more comfortable surface to sleep on due to the pains that rapid growth can cause. Just one of these symptoms of teenage growth can mean that you will to put your hand in your pocket for a new bed – or at least a new mattress. So what type of mattress should be considering? Memory foam, and to a lesser extent, latex, are good for easing the aches and pains of the teenage years. However, a solid base is also good for supporting their growing young bodies. 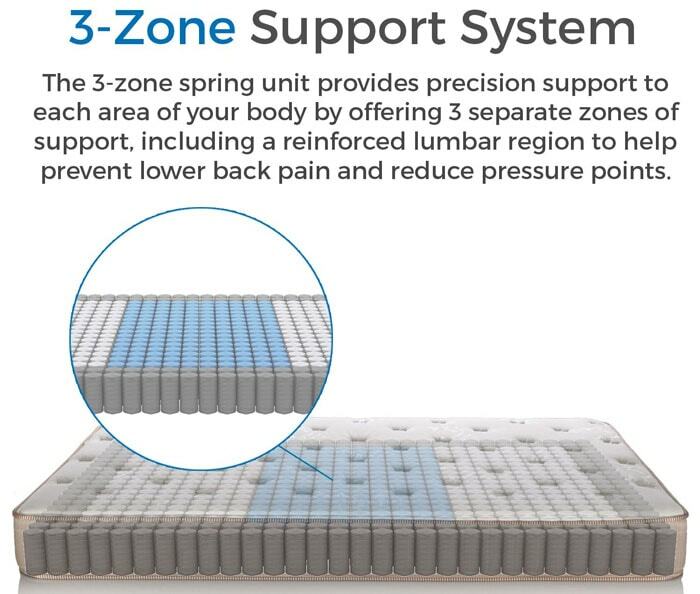 So an innerspring or high density foam mattress with a softer memory foam or adaptive foam top layer would be ideal for them. You get the combination of the support growing young adults need with the comfortable pressure point support that memory foam can provide. A teenager needs roughly 8 – 10 hours of sleep each night. You may not believe this when your teen is reluctant to go to bed, or even comes home so late that it is practically morning! However, it is true – and if your son or daughter has a comfortable bed to get into then they will be more likely to get the recommended level of sleep than if their mattress was old and uncomfortable. So what size of mattress should you purchase? Unless you are also purchasing a new bed, the choice is limited to the size of the bed itself. You can’t fit a Full size mattress into a Twin base. That said, the following sizes are best for teenagers. Twin: A Twin bed is so named because it would be one of two beds located in a bedroom as a pair. That could be in a guest room or a child’s room – maybe you have twins or two children with only a year or so between them. The standard dimensions of a Twin bed (and hence a Twin mattress) is 38 x 75 inches (gave or take an inch in width) and for a Twin XL is 38 x 80 inches. The Twin XL is the ideal size of the mattress for a teenager since its length is sufficient to accommodate a growing teenager. Trouble is, many manufacturers do not offer the Twin XL size, in which case the next in size is the Full XL. The Full XL is likely your best bet. This is 53 x 80 inches. So you get the length you need plus 15 inches more in width. If your teen’s bedroom is large enough for a bed this size, you will not hear them complaining! How firm should a teenager’s mattress be? A lot depends on their sleeping position. A child’s sleeping position will have been established early in their lives, and you will likely be aware of this. The most significant aspect relating to the sleeping position is the position of the spine. The spine has a natural shape when viewed sideways from neck to tail. When viewed straight on, it is dead center straight. So, front and back sleepers should have a mattress that supports this natural S shape as viewed from the side. Side sleepers should have even support to keep their spine straight, again when viewed from the side. Stomach Sleepers: A firm mattress will support the sleepers belly and chest and prevent the spine from curving downwards from the chest and lower abdomen. Stomach sleepers should not sink into the mattress. Back Sleepers: Any comfortable mattress that provides support for the small of the back is good for back sleepers. It’s important that the small of the back, between the buttocks and the upper back, is supported, again to maintain that natural S curve. Lumbar support is the most important factor here. Memory foam can offer this type of support. Side Sleepers: Most side sleepers lie on their arm. A soft to medium memory foam mattress will fold around the arm supporting it, but will also be supporting your side. Side sleepers are not forcing their spine into an unnatural shape, and all that is needed here is support for the arm you are sleeping on. Memory foam is perfect for this. Here are some of the questions we have been asked relating to the best mattresses for teenagers. 1. Why teenagers? What’s so special about teens that they get a special review just for them? Teenagers are growing more rapidly than at any other time of their lives. Their bed – specifically their mattress because that is what they sleep on – must grow with them. It sometimes pays to purchase a new mattress early for a teen because you are sure going to have to change their mattress soon after they leave the age of 11 – 12 years old. 2. How much sleep should my teenage son have every night? According to the Nemours Teens Health site, your teenager needs 8 – 10 hours sleep each night. It is unlikely that many teens get that much sleep, yet it is very important. 3. I can’t find a mattress of suitable size. Do I have to buy a new bed base to fit the mattresses available? First, the most appropriate size of the mattress for a teenager in 2019 is the Twin XL or Full. We include examples of each of these in our Top 5 choices. None of our recommended best rated mattresses for teenagers are larger than these. If you don’t have a bed base or frame suitable for a Twin XL or Full mattress, then yes, you may have to purchase one. Keep in mind that most modern mattresses can fit bases much larger than the mattress dimensions. So, yes, you have to purchase a new bed base, but you can also use a base that is larger than the dimensions of your mattress. There are many bed foundations under $70 that would be good for a Twin XL or Full mattress for teenagers. Choosing the best rated mattress for teenagers is not easy. There are so many different mattresses on offer today. However: make sure the mattress is enough for them to grow up with and that it suits their way of sleeping. Don’t always buy on price: the most expensive is not always the best in the mattress world. It is very much a matter of common sense. Follow our Buyer’s Guide and our reviews and you will find it hard to go wrong.